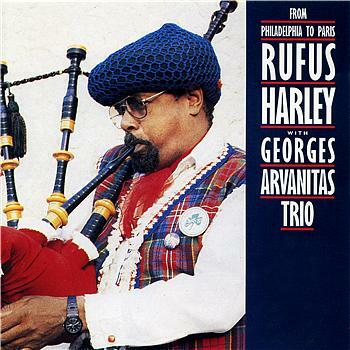 Rufus Harley, Jr. (b. near Raleigh, North Carolina, May 20, 1936; d. Philadelphia, Pennsylvania, August 1, 2006) was an American jazz musician of mixed Cherokee and African ancestry, known primarily as the first jazz musician to adopt the Scottish great Highland bagpipe as his primary instrument. Although born near Raleigh, North Carolina, at an early age Harley moved with his mother to a poor neighborhood in North Philadelphia, Pennsylvania. He began playing the C melody saxophone at age 12, and also played trumpet. At the age of 22, he began studying saxophone, flute, oboe, and clarinet with Dennis Sandole (1913–2000), an Italian American jazz guitarist who also taught several other Philadelphia jazz musicians. Harley became inspired to learn the bagpipe after seeing the Black Watch perform in John F. Kennedy's funeral procession in November 1963. Then a maintenance worker for the Philadelphia's housing authority, Harley began searching the city for a set of bagpipes. Failing to find one, he traveled to New York City where he found a set in a pawn shop. He purchased the instrument for $120, quickly adapting it to the idioms of jazz, blues, and funk. On several occasions, when a neighbor called the police to complain about Harley's practicing in his apartment, he would quickly put away his bagpipes and feign ignorance, asking the officers, "Do I look like I'm Irish or Scottish to you?" He eventually acquired a better set of bagpipes, which cost him a little over $1,000. Harley made his bagpipe performance debut in 1964. From 1965 to 1970 he released four recordings as leader on the Atlantic label (all produced by Joel Dorn, an early supporter), also recording as a sideman with Herbie Mann, Sonny Stitt, and Sonny Rollins in the 1960s and 1970s. He later recorded with Laurie Anderson (appearing on her 1982 album Big Science) and The Roots (on their 1995 album Do You Want More?!!!??! ), the latter coming about due to a 1994 appearance on The Arsenio Hall Show. Harley often wore Scottish garb, including a kilt, in conjunction with a Viking-style horned helmet. After seeing him perform on television, a Scottish family gave him his tartan, the MacLeod tartan, which he wore for the rest of his life. His bagpipe technique was somewhat unorthodox in that he placed the drones over his right shoulder rather than his left. Harley died at Philadelphia's Albert Einstein Medical Center on August 1, 2006 of prostate cancer.